Congressional investigators are taking a hard look at the companies that built and supplied toxic FEMA trailers for emergency housing on the Gulf Coast. CBS News chief investigative correspondent Armen Keteyian speaks exclusively with people who worked on the trailer production lines and say the manufacturers knew they had a formaldehyde problem. Linda Esparza and her son Tommy Yager can be added to the list of thousands of families feeling the effects of formaldehyde in the trailers FEMA sent to the Gulf Coast after Hurricane Katrina. "Fatigue was a big, big problem," Esparza said. "It would be cold, flu like symptoms," Yager said. But they didn't live in the trailers. They built them, in Indiana, for an RV maker, Gulf Stream Coach. The company got the largest trailer contract right after the hurricanes hit in August 2005: More than $500 million to supply 50,000 trailers as quickly as possible. "How much pressure were you under to produce those trailers?" Keteyian asked. "Oh, incredible. Incredible amount of pressure," Yager said. By early 2006, the Gulf Stream Coach plant was cranking out more than 100 trailers a day - about three times normal production. That's a pace, former employees say, that quickly forced the company to turn to low-quality materials. "I was the one that laid down those floorboards that are so famous right now for the amount of formaldehyde that was in them," said Yager. "Oh yeah you could smell something wrong with the boards." A certified EMT, Tommy Yager says he came to the aid of sick co-workers almost daily. "We had guys that would have such bad flu symptoms they'd drop right on the floor," Yager said. "Oh yeah, just keel over." Current and former Gulf Stream employees told CBS News the company knew it had a problem with formaldehyde. "We were instructed to open the doors and windows so that the odor wouldn't be as strong when the FEMA inspectors got there," Esparza said. 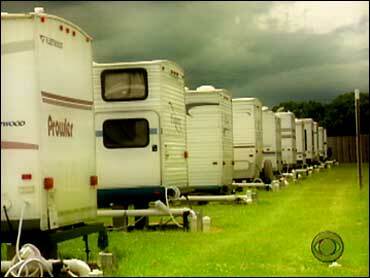 Attorney Sean Trundy is suing several manufacturers on behalf of those who lived in the trailers. "They fulfilled their contract at the expense of the people who built the trailers and, ultimately, at the expense of the people that were put in them," Trundy said. CBS News wanted to talk to Gulf Stream Coach officials about what happened in this now-shuttered plant in Etna Green, Ind. But the company declined our request for an interview and instead issued a statement. "In some ways, I feel betrayed and, in other ways I feel ashamed," Esparza said. "I put my name on those products, and maybe if I'd asked more questions." Questions that will almost certainly be asked Wednesday when the head of Gulf Stream Coach and three other trailer manufacturers testify, under oath, on Capitol Hill.